In this blog, we will talk about the most important changes in the newly approved IEEE 1584-2018 standard (A guide for performing Arc flash hazard calculations). We have also covered the differences of previous IEEE 1584 Standards. The newly revised edition of IEEE 1584-2018 standard is approved on 27th September 2018 after conducting of 2000+ tests. It provides mathematical incident energy model for electrical designers, professionals, managers and facility operators and working personnels in determining the arc-flash hazard boundary and the incident energy to which workers could be exposed during their work on or near electrical equipment in any facility. Importance of Arc Flash Hazard Analysis – Is Arc Flash Study Crucial in Power Systems Industries? We had previously written an article about the Importance of Arc Flash Hazard Analysis – Is Arc Flash Study Crucial in Power Systems Industries? If you haven’t checked it out, please click below. It will help you to grasp the information available in this article easily. You can check the details on the above standards on the official website of IEEE. Introduction - What’s the need for IEEE 1584-2018? The newly revised edition of IEEE 1584-2018 which was approved on 27th September 2018, provides a mathematical incident energy model for electrical designers, professionals, managers and facility operators and working personnel in determining the arc-flash hazard boundary and the incident energy to which workers could be exposed during their work on or near electrical equipment in any facility. Before that, every industry follows the IEEE 1584-2002 standard for the incident energy calculations. Almost every Power Systems Study tool like ETAP, SKM, Power world etc. follows the same standards for Electrical power systems studies. However, after extensive research and testing, many researchers found significantly different values than those calculated using the model found in previous standards. They analyzed their results on different scenarios, bus bar configurations and different voltages. That’s why the IEEE along with the NFPA joined hands and started working on the collaborative Arc Flash Research project. After conducting 2000+ tests spanning a wide range of voltages, configurations and parameters, they approved the 6th draft which was released to the public worldwide. The first edition of IEEE 1584 was released in 2002, sixteen years ago from today! And, revisions and upgradations were inevitable for such a long time down the road. Let’s take a look at the events that took place in that timeframe and led to a new edition being released this year. There were some objections to the IEEE 1584 1st Edition from all around the world. The professionals began to inquire about different areas covered in that standard. So it was decided to step it up to a new level. As a first step in the making of the new edition, a collaboration was made with the NFPA during 2003 to 2006 that was termed IEEE/NFPA collaboration. The budget was higher and it was then decided to fundraise about $6.5 million! Things were going as expected, until came the period of the Great Recession (2007 – 2008). The collaboration had managed to fundraise $3.5 million till that period and then it was decided to begin the research and testing. And so that year was dedicated to the initial research phase. The following three years (2009 to 2012) went by while carrying out the testing and producing the initial model. At the end of this period, a report was published that considered the areas that were absent from the previous standard. That first report was handed over to the group review committee to make refinements, which led to a final report. The year 2016-2017 was utilized in developing the first draft of the new revision of IEEE 1584. It consisted of the unchanged concepts from the previous model and the new recommendations approved by the review committee. Then a consensus voting took place within the working group to ensure that the first draft is good to go before passing it on to the final voting. The official voting that took place (2017 – 2018) was the sponsor balloting of the 2nd edition and included around 160 ballotters. Successfully, the draft was passed. However, there was a plethora of comments that needed to be addressed. A Ballot Resolution Committee was formed (2017-2018) to efficiently address the 1000+ comments made on the first draft of the IEEE 1584 2nd edition. The panel consisted of nine members. A new draft was developed that passed the second phase of balloting and the comments were reduced to a 100. To address the iterative comments, there were several drafts created by repeating the process. Finally, the sixth draft was created, and it was passed on to the IEEE standards association to be approved. It was a long process. Fortunately, it passed and the IEEE 1584 Second Edition was published in 2018. In the previous edition of IEEE 1584-2002, there was only one electrode combination i.e. three electrodes in a vertical configuration. Professionals began to inquire about the other possible combinations, because different configurations can have a major effect on the overall incident energy. If we use Horizontal bus bar configuration, then it provides greater incident energy comparable to vertical electrode configuration and vice versa. Horizontal enclosure results in an incident energy upwards of 3 times that of the existing VCB configuration. What might be even terrifying is that the early arc flash testing that was done on vertically oriented electrodes only accounted for the radiant heat energy of an arc flash. We know that there is also an "ejected arc" associated with the arc flash incidents. This is better known as a plasma ball which can come in direct contact with the worker. Testing of the horizontal orientation type arc flash incidents has shown that the plasma jet may be more hazardous than the radiant heat in these cases... thus further complicating the calculations. Therefore, the IEEE 1584 latest edition adds 4 more electrode combinations. We will talk about these in detail in next blog. However, you can refer to Annex G of the IEEE 1584-2018 standard. The voltage range remains unchanged in the IEEE 1584-2018 edition, however, the range of short circuit currents, conductor gap and working distance has been revised. We can have a look at the changes below. In the new standard of IEEE 1584-2018, the dimensions of the metal box enclosure for VCB, VCBB, and HCB electrode configurations is explained in detail. Typical dimensions are selected based on the bus voltage and equipment type. You can also check the Table 8 (Classes of Equipment and Typical Bus gaps) of the IEEE 1584-2018 for more detail. The range of the model, methodology, and arc flash equations are mostly different from the previous version. You can refer to the section 4.3 of the IEEE 1584-2018 for comprehensive details. For systems outside the IEEE 1584-2018 range of model, the Ralph Lee method will generally be used. Set the lower bound tolerance for the minimum arcing current in the Arcing Fault Current Tolerances option. The highest incident energy between the two arcing currents will be the one reported in the Arc Flash table. The PPE is determined based on the calculated Incident Energy and the user definable Personnel Protection Equipment Table. In the earlier editions of IEEE 1584, there was a rule of 85% factor for reducing the calculated arcing short-circuit current for systems up to 1 KV. The reduction was to account for variations that may occur in the actual arcing current, which could affect how fast a protective device may operate in case of any fault. If the reducing arcing current resulted in a longer clearing time and larger incident energy, the results on the adjusted current would be used. So, instead of a fixed 85% factor rule, IEEE 1584-2018 has used a more detailed Arcing current variation adjustment/correction factor in the calculation that has completely replaced the 85% rule for increased accuracy. This new factor is applicable for all voltages and represents a more accurate current variation on the electrode configuration as well as other factors. Before producing the draft, it was important to carry out several tests that may aid in gathering accurate and adequate information. The 2002 Edition of IEEE 1584 was based on a little more than 300 arc flash tests. 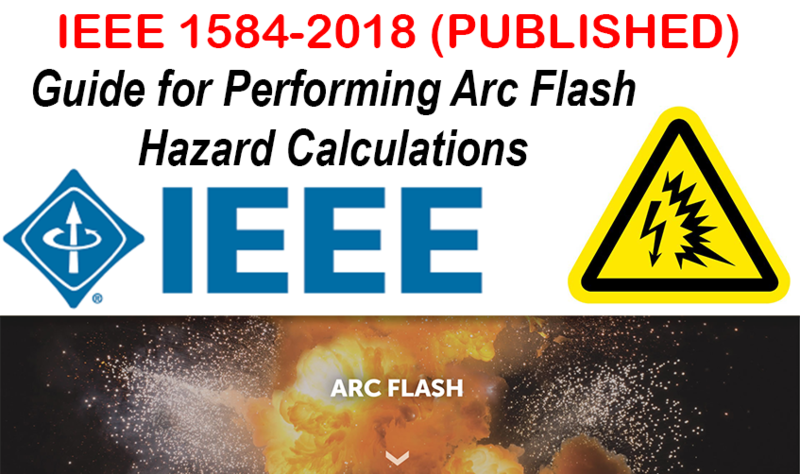 Over a period of 16 years and facing revisions, the 2018 Edition of IEEE 1584 had to undergo 2000 more arc flash tests, consequently achieving more accuracy. With that in mind, the team gathered significant information on light intensity, sound intensity and pressure waves that are the result of arc flashover. For the calculation of arcing current, the previous edition gave two equations that were to be used. The two equations were for two different ranges of operating voltages or continuous voltage spectrums. One was for 205V to 1kV and the other for 1kV to 15kV. With the passage of time, IEEE 1584 – 2018 updated this calculation method and introduced three different equations for a single value of voltage i.e. 600V, 2700V and 14.3kV. The new edition of IEEE 1584-2018 includes new enclosure sizes and gives a correction factor, if there is a need to adjust an enclosure size. The enclosure size can have a significant impact on the arc flash energy being expelled and reaching a working personnel. To address this issue, additional enclosure sizes were included in the test program. An enclosure size correction factor has also been introduced to adjust the incident energy for smaller and larger enclosures. For equipment operating at voltages less than 1,000V, the next edition now makes a distinction between “shallow” enclosures which are less than eight inches in depth and “typical” enclosures that are greater than eight inches in depth. We will cover this topic in more detail in a future blog. The previous edition of IEEE 1584 had a table that classified different equipment into four distinct classes or types. In comparison, the new edition has a revised table that provides information on nine different classes or types of equipment. Keeping in mind the changes above, you may wonder how to perform calculations for a 480V system, given that The three equations to calculate the arcing current were for operating voltages of 600V, 2700V and 14.3kV. Calculating the arcing current using the 600V equation and then interpolating the result to find out the minimum arcing current with respect to 480V. Yes, interpolation is something new which has been introduced in the new edition, that can change the way you perform arc flash calculations! As its name clearly represents that the Transformer rating less than 125 kVA has a very minimal influence on the Arc flash, so there was a cut off limit set for the transformers. In the new edition of IEEE 1584-2018, there were no tests conducted on voltage less than 208 V and current less than 2500 A. "sustainable arcs are possible but are less likely in three phase systems operating at 240 V nominal or less with an available short-circuit current below 2000 A." This tells us that we can still calculate incident energies for voltages below 240V and currents below 2000A, but the chances of an arc flash are minimal. In the previous editions of IEEE 1584, it was considered that there is a different influence for systems based on its Grounded and ungrounded configuration. There were 2 constants introduced in previous editions. For ungrounded, the constant was null and for grounded, the constant was 1.5. But in the new edition of IEEE 1584-2018, the model is based on a more stable arc, so there is no difference in the calculations based on the grounding. After conducting several tests for different scenarios, it was found that there is no influence of Grounded and ungrounded systems in the calculation of incident energy. The 2 sec cut off rule for all the protective devices remains the same in the new standard of IEEE 1584. For incident energy calculations, it was decided to use the same 2 second criteria for the capped time of the protective devices. It means, protective device need to interrupt the arcing current within 2 seconds. The IEEE 1584-2018 standard is very detailed and thorough. Therefore, it is not possible to include everything in this blog. We have briefly mentioned some of the most important changes that are explained in the new standard for performing Arc Flash hazard calculations. We will continue explaining some more changes in future articles. However, if you have any feedback or you want us to cover some of the above topics in details. Kindly give us the heads up in the comments section below. You can purchase a copy of IEEE 1584-2018 from the given link. Click Here to get your copy now!